Sipho community · Posted in Let's create an unusual! About time I broke my silence here. As stated earlier, this is but a taste of what I've done. I've been busy creating and re-creating various creatures, and I hope to show more soon. A rogue specimen has escaped from 3RR0R (Real name classified)'s lab. It was last seen escaping the Free Roam area. An image of the specimen's last known form is provided below. WARNING: This specimen is HIGHLY AGGRESSIVE AND DANGEROUS. Do not attempt to dispose of it yourself. 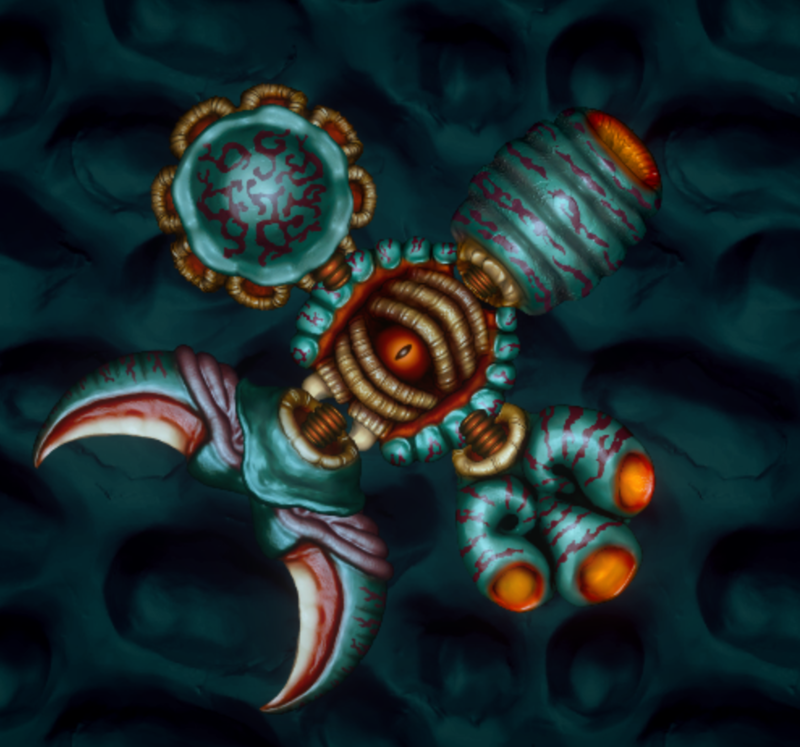 Despite its large form being supported by only five movement zooids, rendering it terribly slow, it made up for it by being extremely heavily-armed. Mine-producing zooids line almost the whole of this creature, with the exception of the front and back sides, which are lined with Pushers instead. 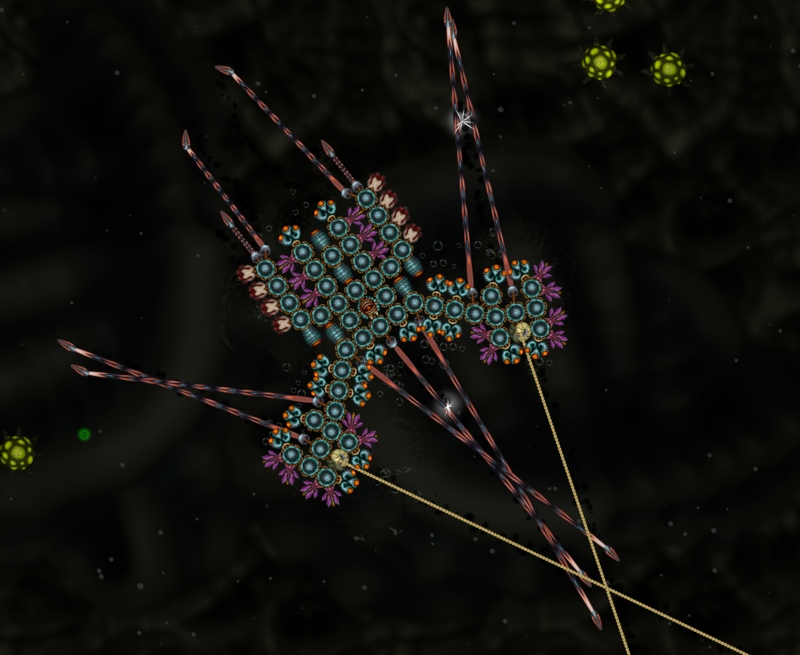 The creature used the all-too-familiar "weapons rack" structure (seen used by another Buginis specimen in my previous post), with one row being used to house movement zooids instead. 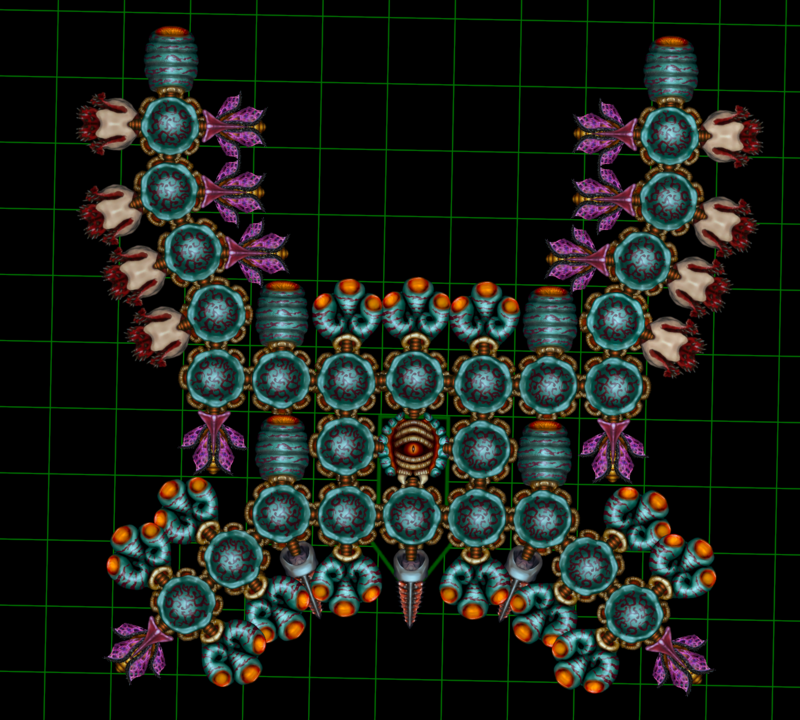 By placing the Pushers at the front of the rack, not only do the poison mines get flung out, but the range of all its weapons can be boosted using the pushers, allowing for a ridiculous amount of firepower to be concentrated on its front. 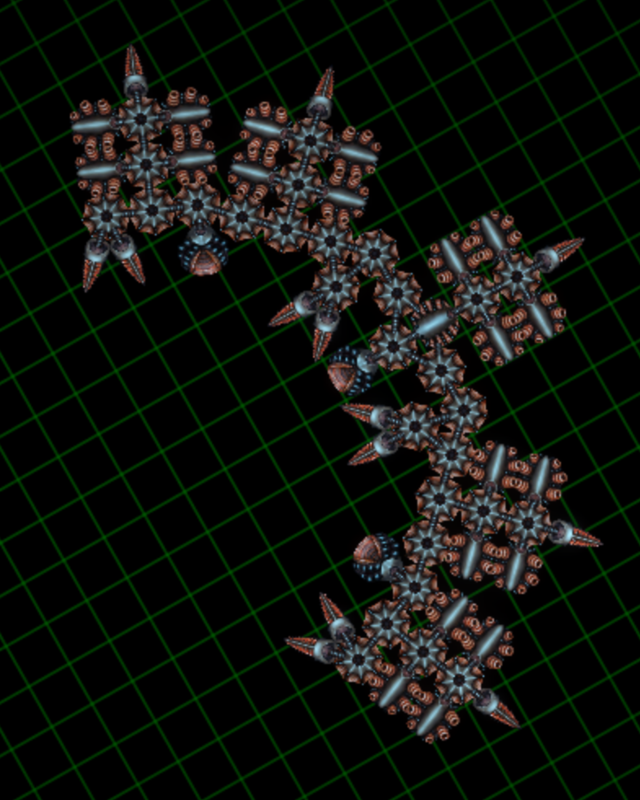 The rear-end Pushers help somewhat compensate for the enormous pushing power of the front end, and allow this creature to perform a unique maneuver: emitting mines while activating its pushers , the creature slowly rotates in circular manner, causing two streams of poison mines (which are flung out due to the Pushers) to seemingly emanate from the creature. As if the huge amount of Miner zooids weren't enough for area denial, this maneuver essentially makes the creature nigh-unapproachable, unless one intends to get heavily poisoned. My advice to all other fellow researchers: please do not let your creatures get anywhere near that thing. I will find a way to keep it contained once more, and I don't want it hurt, nor do I want it to hurt your specimens either. We all share a common goal after all: to create the most powerful specimen of all. However, as you can see, control over the specimens we make is still crucial, so that incidents like THIS won't happen(I don't want entire ecosystems destroyed just because something got loose)! UPDATE: Alert is no longer in effect. Specimen retrieved. 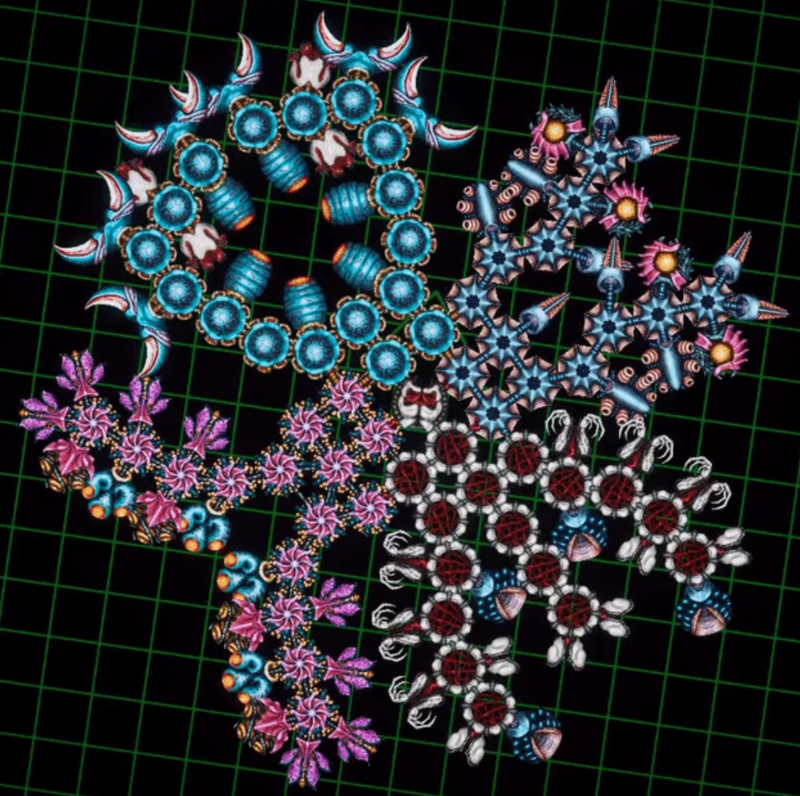 As you can see, it has taken on circular form, evenly spreading its Miner and Pusher zooids, using the "instant mine field" tactic when it uses its rotational maneuver. The Sniper zooids now cover the four cardinal directions of the creature, with less zooids per direction, but more coverage overall. Furthermore, it seems to have done away with the Flak and Squirter zooids (perhaps it deemed them ineffective?). To prevent this thing from breaking out again, and to study it better, I have placed it into a special isolation tank that simulates the Free Roam area (no linkages whatsoever this time!). That should keep it busy enough to study it! ...Oh, right, I forgot to give this one a nickname. 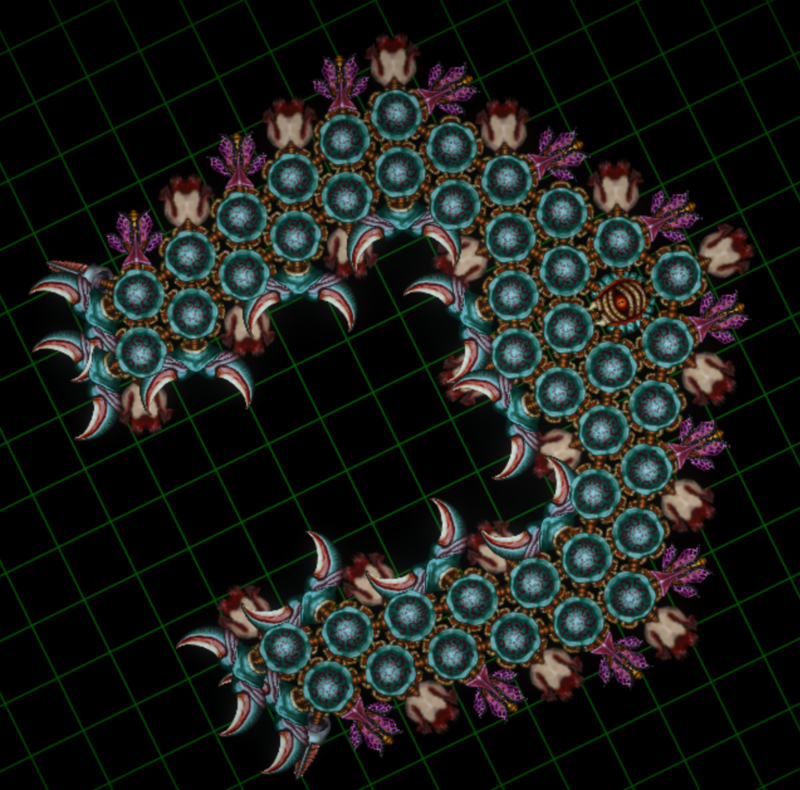 What you see above is a ravenous predator, sporting yet another type of "ancient zooid" - the Energy Leech. As its name implies, it is basically the Leech zooid, but it saps energy from opposing siphonophores, dealing next-to-no damage as a trade-off. 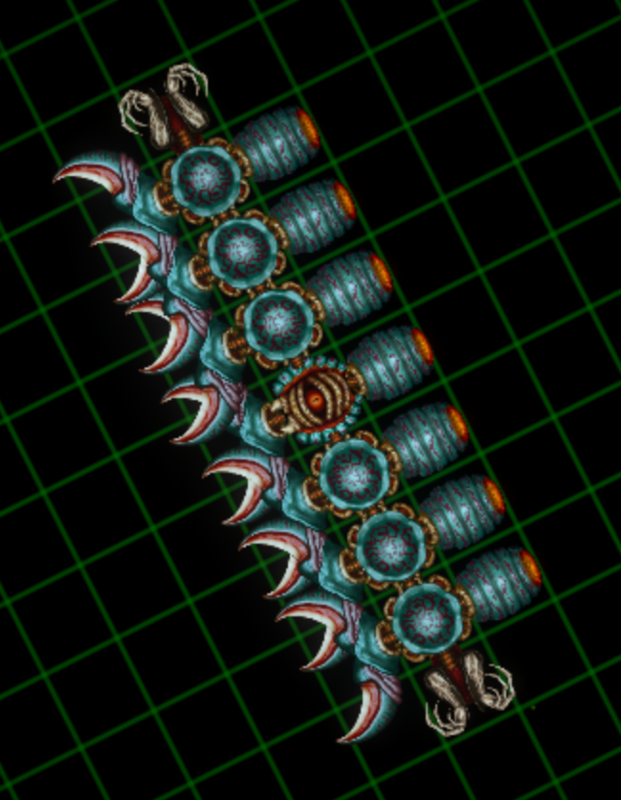 Due to the similarities to the Leech, the Energy Leech also has the same "latching" effect that allows it to pull enemies that it is attached to closer. The above creature has exploited this by putting a row of spikes in front of its Energy Leeches - lowering the effective range of the Leeches, but making them into close-range grappling hooks that hold on to any enemies attempting to escape from the spikes. The result is a creature capable of tearing through foes, while making sure that running isn't an option for the enemy. For good measure, the creature also evolved a row of Poison Squirters, in the event the enemy is tough enough to require the use of poison to soften it up. Finally, the relatively compact size of this creature makes it rather agile - only being out-sped by creatures composed almost entirely of movers, or creatures that are reduced to their "core". After doing some further exploration, I was unable to find a specimen with the Ancient zooid that I was looking for. I have managed to get a hold of the DNA sequence of the zooid from an old fossil! Known as the Grabber, its name alludes to its function: It acts as a biological grappling hook! With much excitement, I decided to have my first foray into gene-editing, and "injected" the sequencing into an existing specimen that had a remarkably similar attack mechanism to the previous siphonophore I showcased (i.e. the post just above this one), allowing it to grow the zooid. The above image shows its initial form, moments after the extracted sequence was injected. Not only has the specimen grown to a considerable size, but it decided to incorporate the "pusher spike launch" method onto the Grabbers as well! Those Grabber hooks can easily reach outside of its field-of-view, allowing it to cause all sorts of chaos: Preventing enemies from escaping, dragging in unexpected obstacles (i.e. spike balls), etc. 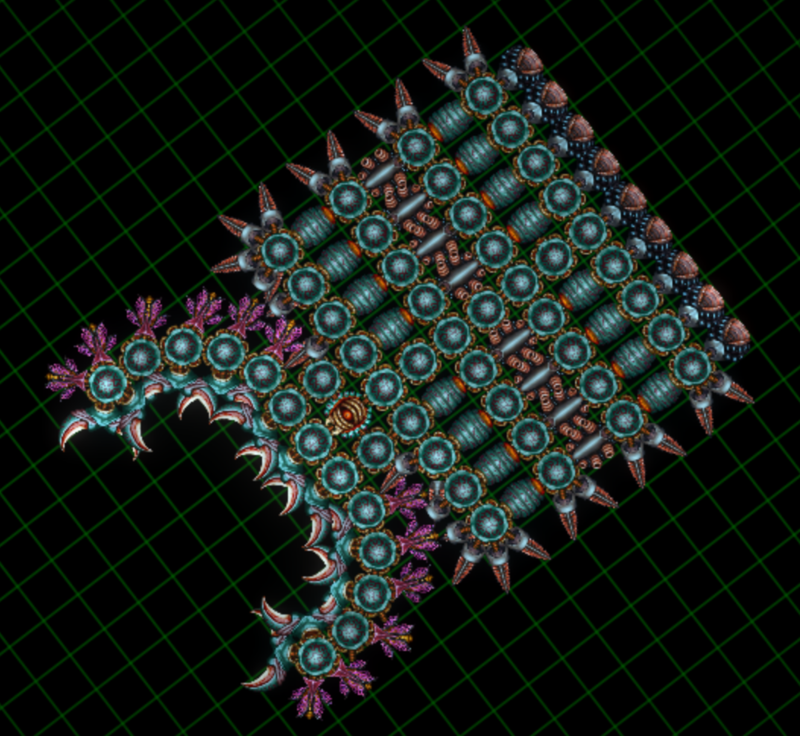 Even without the use of the Grabbers, its large array of Pusher-launched Spikes create a large "area of death" around it, and its front-facing array is strong enough to chew up Frakir* specimens with ease! 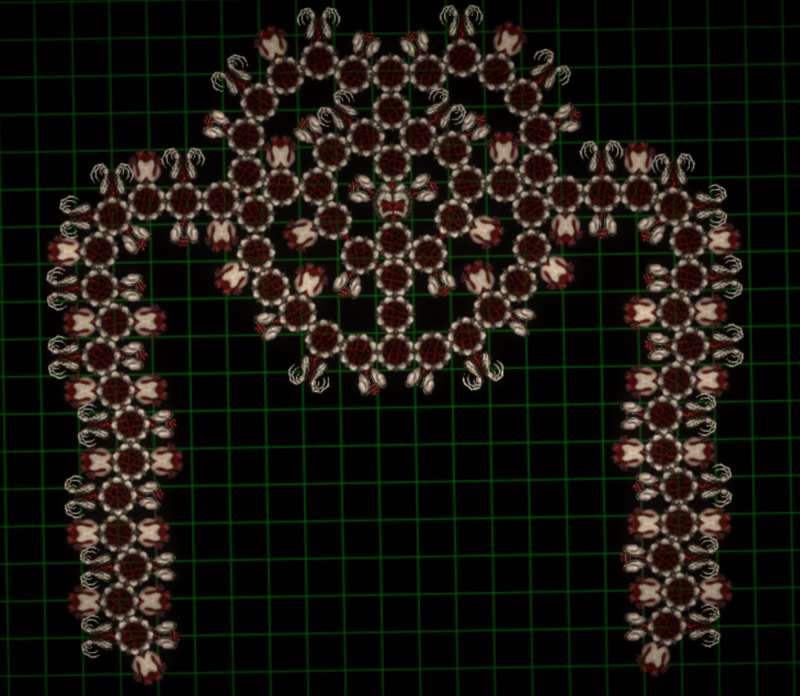 ...the "Pusher" zooid seems to have gotten rather huge boost to its strength. 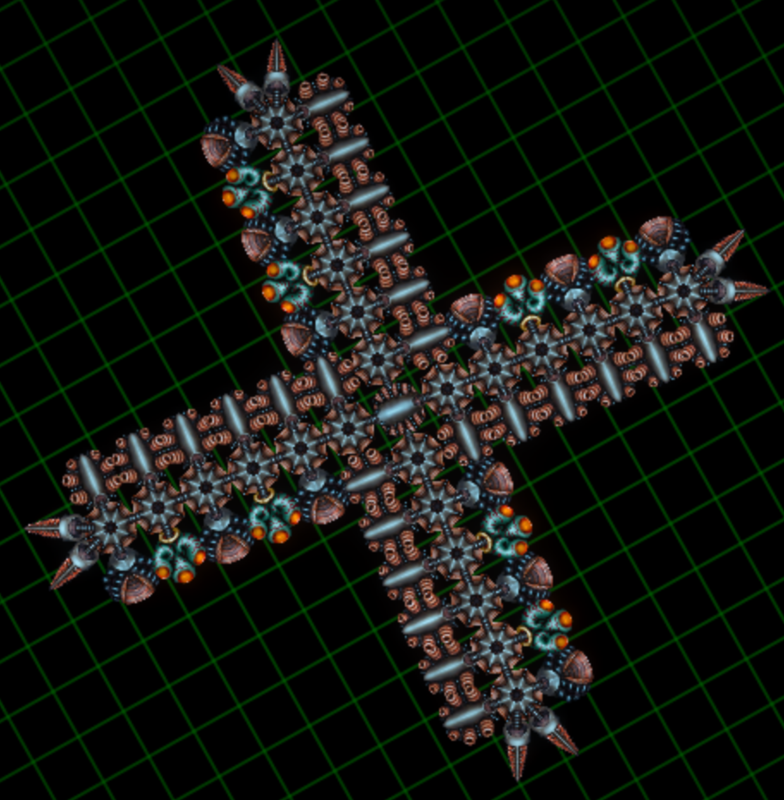 Utilizing only 3 spikes and a whole load of pushers, this ruthless little fellow is able to launch its spikes absurdly far. Furthermore, due to the constant push provided by the "Pushers", the spikes will move rather erratically after being fully extended, acting as a pseudo-flail which decimates enemy zooids at a speed that's never been seen before. The only feasible downside has got to be its size and speed: it lumbers along and turns at a rather low speed, potentially allowing enemies to out-run or ambush it, although none have been able to do it so far (this thing has adapted a "kill it before it has a chance to kill you" tactic that leaves none in its wake). Even so, by coating itself in "Pushers", it has sufficient energy to always keep them powered if need be, being able to use said "Pushers" as a force-field of sorts, rendering it untouchable to most enemy breeds. That is the Sniper zooid. 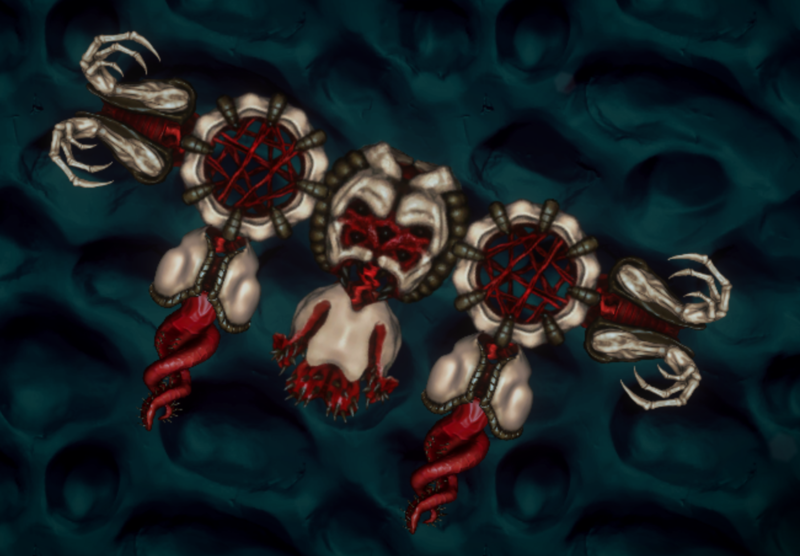 It does not come from any species whatsoever, and is instead a random drop from bosses. 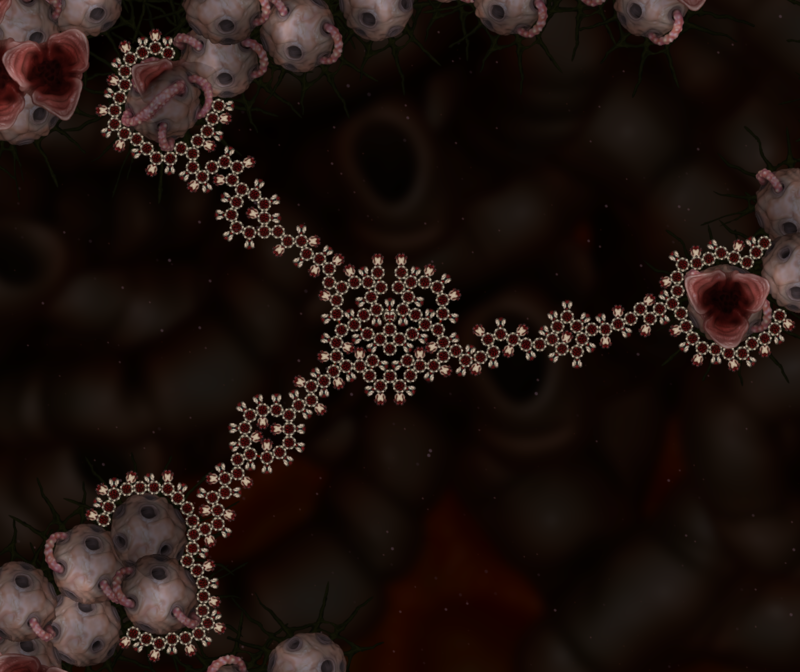 It is only available in the Early Access version of Sipho that is available on Steam, along with a couple of other similar zooids. 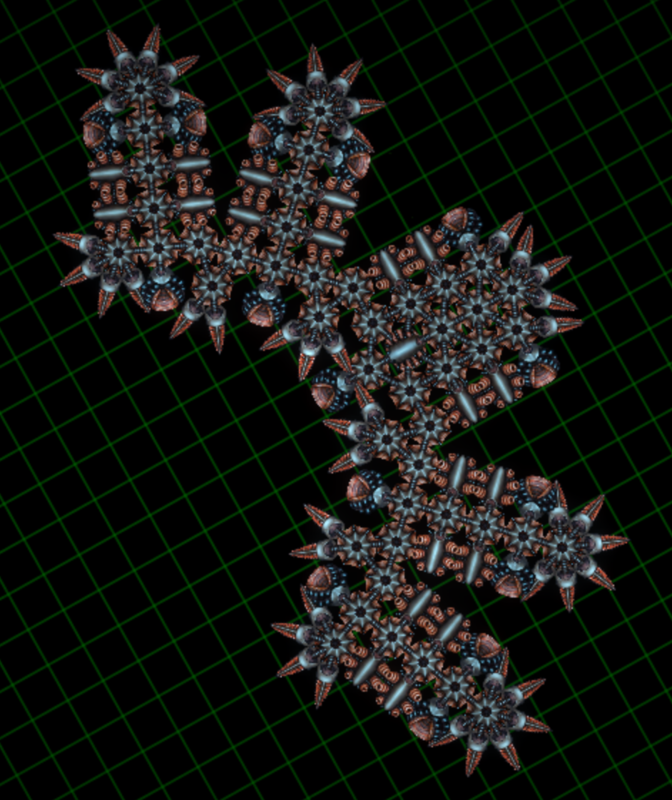 A twitter post mentioned one of them as "Ancient", so I usually call these types of drop-only zooids "Ancient Zooids". After a short period of silence (and experimentation), I think I'm ready to showcase something newer. 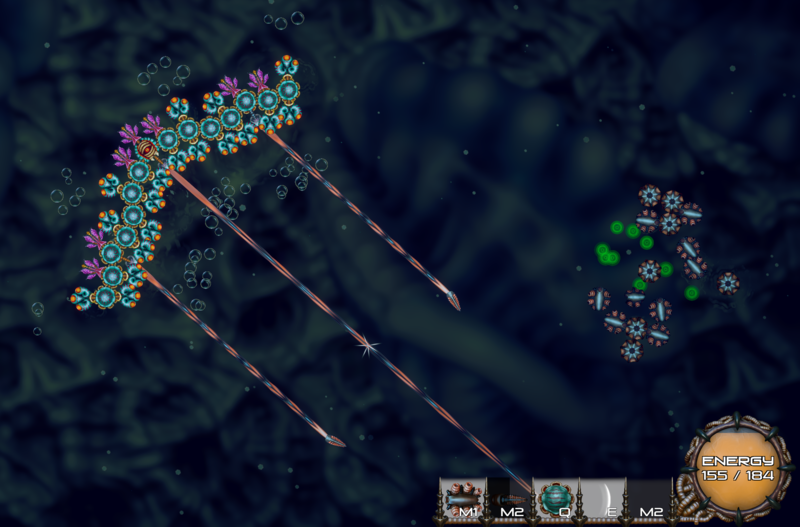 Making "bullet hell" a reality in Sipho, The Maelstrom Marksman makes its debut. 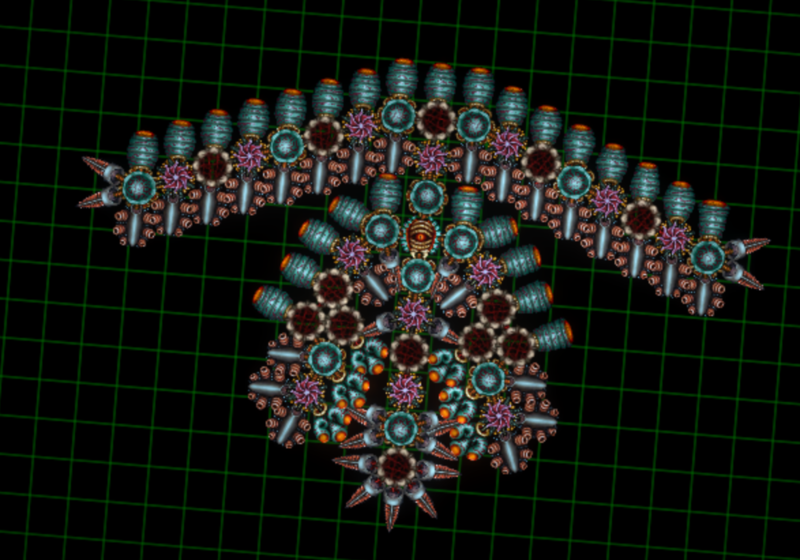 A proper long-range fighter, any siphonophore worth their salt (and nutrients) would know to stay as far away as possible from this thing's front end. Furthermore, it appears that this this has taken measures to ensure that flankers would get a nasty surprise: its sides are lined with poison mine emitters and a rather "shocking" armament, to say the least, allowing it to escape from aggressive melee-only attackers with ease. 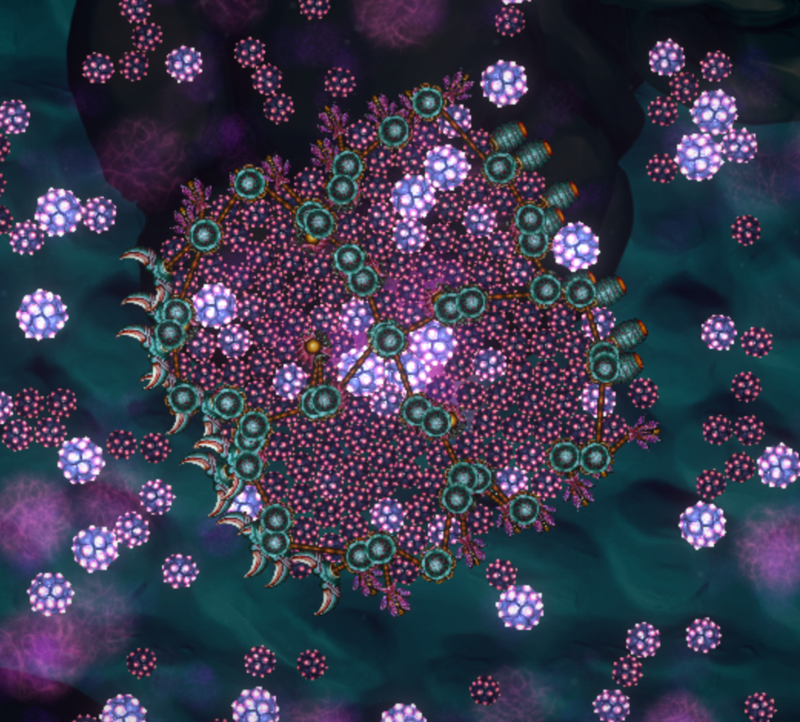 These zooids also happen to provide the creature with the energy it needs to power its weapons, since Sniper and Flak zooids are very energy-hungry. The most curious thing to come from this specimen has got to be its Sniper zooids, as they are a completely new type of zooid that doesn't seem to belong to any of the 4 known species that live in the current ecosystem. Some older research notes suggest that this zooid is one among a few others that may have originated from a long-extinct species, likely surfacing in today's specimens due to genetic drift. Sipho community · Replied to Dominas in Let's create an unusual! Recently, there have been reports that the Big Bad of the "???" species adapting and evolving, so as to suit its sessile nature. I've decided to capture one specimen and experiment on it (not to worry, there are a few instances of said "Big Bad", commonly referred to as a "Boss". How else does one always seem to encounter one right after C'thal? ), however, the process of removing said specimen from the environment did require me to cut out all of the "enclosing" section of the specimen, leaving the "head". 1. The "Head" slowly sprouted movement zooids after sitting still and receiving a lack of prey/nutrients. - The walls are not spaced as far apart as that of a sessile specimen. - The outer side of the walls are saturated with Movement and Eater zooids. - On the other hand, the inner side of the walls are lined with Leech and more Eater zooids. - There are no Spawner-type Eater zooids (distinguished from its Stunner counterpart by their dark-red colour) at all. - Finally, of course, the walls are not fully enclosed. It continues to prey on whatever I can throw at it, as none of the siphonophores even dare to attack it. Unfortunate Advena specimens that accidentally brushed their spikes against it receive immediate retaliation by being torn into shreds by the many Leech zooids on the inner walls. On a side note, this thing can turn surprisingly fast! In conclusion, the "???" species as a whole appears to have an absurd rate of adaptability, using whatever means necessary to survive if push comes to shove. Sipho community · Replied to Iztacmizton in Let's create an unusual! 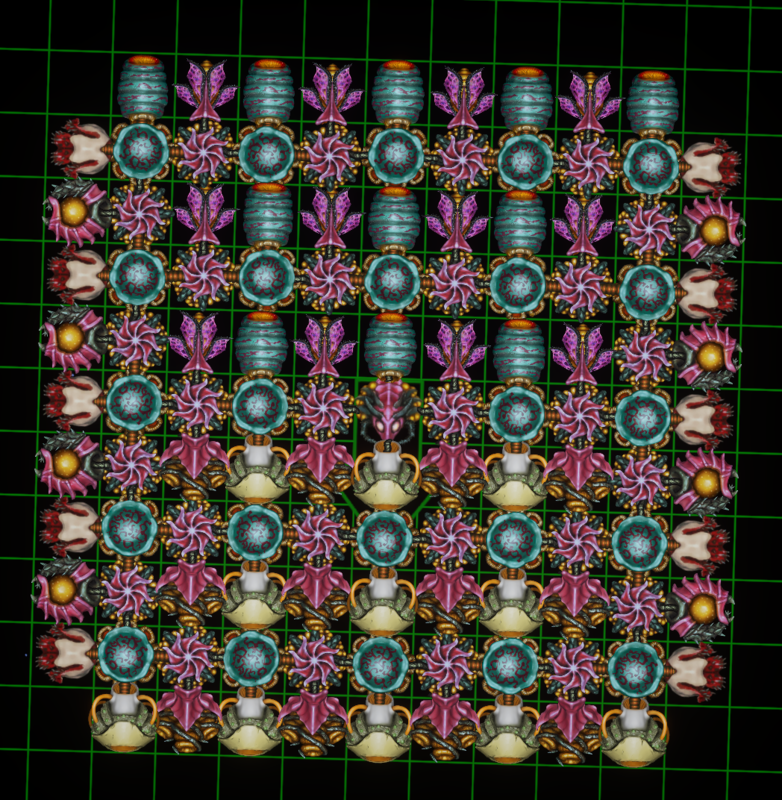 After a bit of testing, I've come to the conclusion that yes, the above creature does need that many engines. 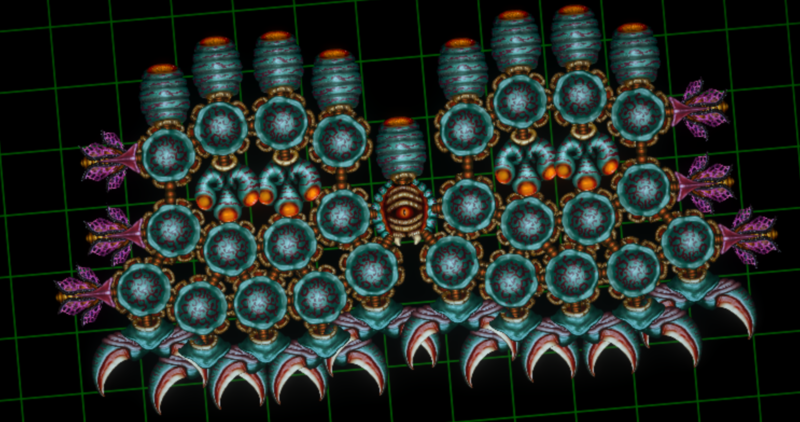 Even though its speed matches (or is slightly slower) than a smaller creature with only 2 small engines (pictured below), the greater number of pusher-type Eater zooids means that the engines are able to function for a much longer period of time (since each engine adds more energy regeneration with each Eater). The creature below can also achieve speeds equal-to-or-higher-than the above creature, but it can only do so for a much shorter period of time. As such, it is actually recommended to build larger creatures if one wants to use the Don Quixotting method of movement, due to energy constraints and the fact that engine size/count negligibly affects the speed of the creature while Don Quixotting. Also, as you can see, the slightly-larger-than-normal gap between zooids is present here as well. As I've said before, it emerges due to the building method for the engines seemingly screwing up the soft body handler so as to accommodate the pusher-type Eater zooids (which are slightly larger than structure zooids) in-between the structure zooids. I've yet to do further testing with said engines and how the number of engines affect speed, although that is on my to-do list. 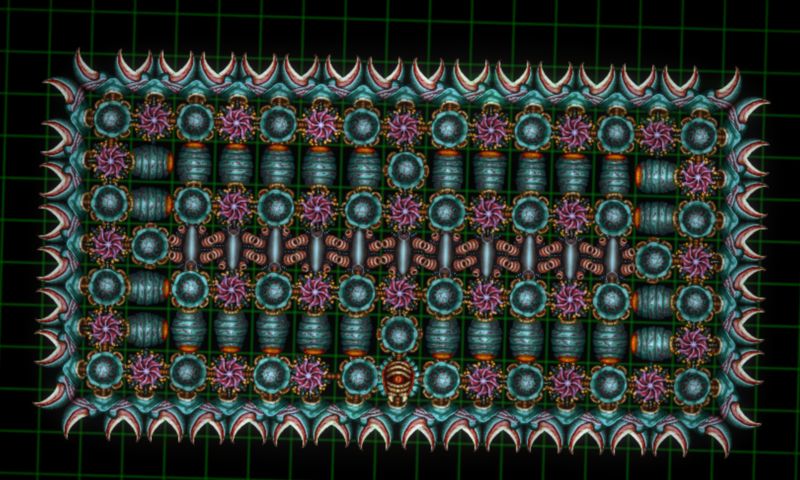 As for the first row being ever-so-slightly further, that is the result of the soft-body handler glitching a little (normally extended connections like that are not possible, but would you know it, the building method for the engines can result in said glitch occurring) due to the symmetry of the creature (the devs did state that the handler hates symmetry). Nicknamed "Sledge-Hammerhead", its streamlined body houses 4 Don Quixote-Engine units (each consisting of 3 pusher-type Eater zooids and several Structure zooids) and is lined with rattler-type Swimmer zooids (as a turning mechanism and for smaller movements) and stunner-type Eater zooids (to stun any flanking enemies and to increase energy regeneration due to absurd energy consumption of the 4 aforementioned "Engines"). Its namesake comes from the biological battering ram that shields its head --- a far cry from previous Charger-type creatures that I've made discovered. It is significantly larger than most other charger weapon types, and boasts a unique "spring cushion" design (cushioned by more spikes?!) that acts as a sort of "insurance" for the creature in the event the front of the weapon breaks off. So far, that event has never come to fruition, as the design is thick enough to support itself on its own. Any wondering opponent in this thing's path is sure to experience a painful predicament --- provided they come out alive. Sipho community · Replied to Mr.Googol in Let's create an unusual! This new organism is no longer a new structure(?). Oral devices are maximally simplified, in order to increase the internal cavity of the body. The large body cavity is filled with nutrients for rapid recovery and masking (The "bait" effect). The surface of the body is covered with leech zooids that are able to grasp and sever any unfortunate victim that attempts to flank it, all the while helping to regenerate its own health from draining said flankers. Wow, "Greed" sure has evolved a lot! I've also noticed something you didn't mention: This new creature of yours has stunning eater zooids in its mouth to attract nutrients and to ensure that there's no escape! ...do whatever this is supposed to achieve (a minefield, maybe? But...why in this fashion?!). 1. It definitely seems that this creature is utilizing this strange adaptation as a way of distributing mines unevenly, or perhaps it's something to do with the way it's "storing" the mines within itself...? 3. Man, if only I could test this thing against the Advena Boss! That thing was already freaked out by poison mines! Yea, claws do have their downsides that balance it out; mainly being the fact that they're strictly close-range, which means any creature that's able to out-maneuver and out-range you will be more than just a "little annoyance". Well, on a brighter note, see those spikeballs? A basically exposed rear and only a 1-structure-zooid-thick support for the spiky wall of death? It's no wonder that this thing once tore itself in half from the sheer force generated by the pushers and a single enemy spike clipping through the wall! Thankfully, it has only done this once, and that aside, the wall of spikes make very short work of whatever unfortunate creature lies in its path. On a side note: you're not the only one around here who likes the Claws/Pincers. They are honestly quite overpowered! Oh well, makes it all the more easier to get to Free Roam! Sipho community · Replied to Sipho in Let's create an unusual! I converted Gluttony into a Mine Shotgun just to make this gif! It's a living Poison Mine shotgun. It operates by stockpiling Poison Mines within its "chamber", before spewing out all the mines at its target. The mines travel a surprisingly long distance, allowing this creature to attack at a range further than any species so far. 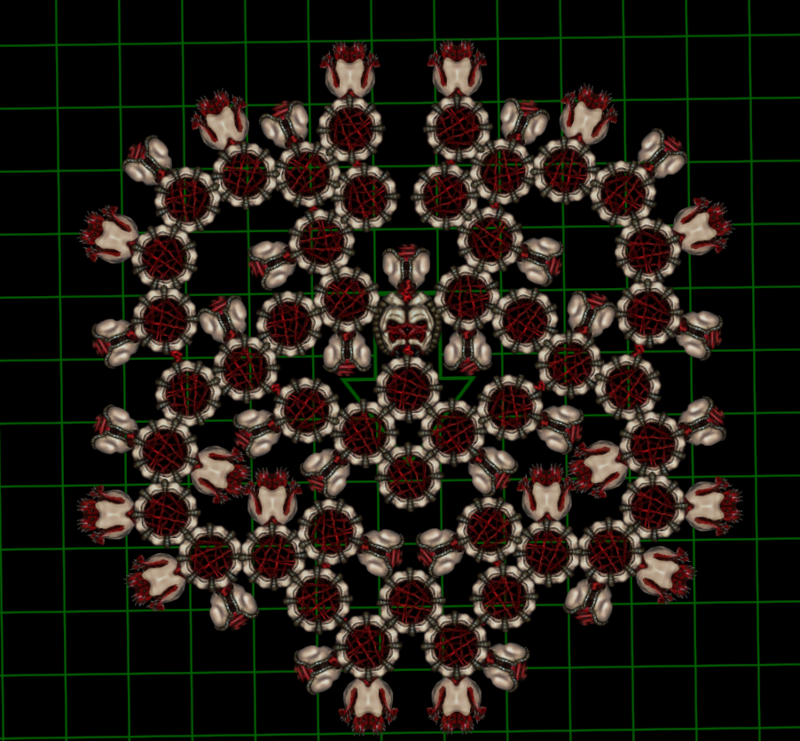 It has also covered itself with spikes as a deterrent, as it is rather fragile (a single structure connects the whole "chamber" to the core; deterrence is much needed!) for what it is. Very interesting creature you have there! There seems to be one glaring issue, though: Its core is quite unprotected, and even though most species will fit into its stomachs just fine, having an Advena with its spikes stuck in there would be rather risky, no? * Creature did not actually evolve into this form through natural means. This creature is made by yours truly. Credit goes to you for the idea and concept behind Greed. 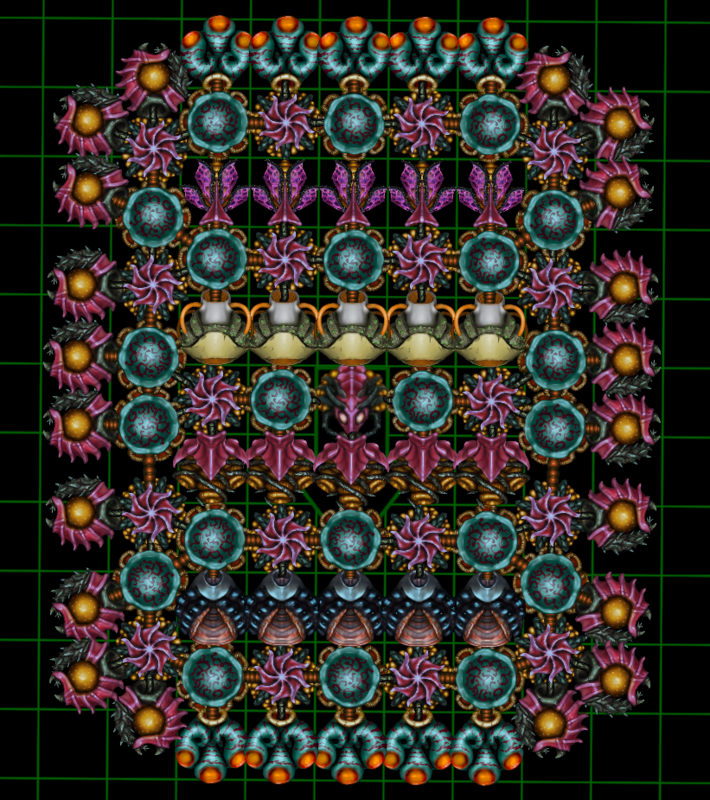 Sipho community · Posted in Boss strategies! I have come to add more to this guide. Of course, more spoilers, especially for those who have difficulty making it past the "???" species boss. Before that, though, let's touch upon the third boss once more. I have beaten it on multiple occasions already, however, the difficulty of the boss is so ridiculous, to the point where the tactic used by yours truly to beat that monster of a boss is essentially an exploit. What you must always keep in mind for the third boss is to never take it head-on. Even if you kill it, if it manages to spawn a minion, they can and will stunlock you, as the minions are programmed to simply ram into you eternally while attacking. The minions are very good at pushing you around for something their size. 1. Make sure your siphonophore is armed enough to deal with the boss quickly, which also helps to deal with any minions that remain after the boss' death. 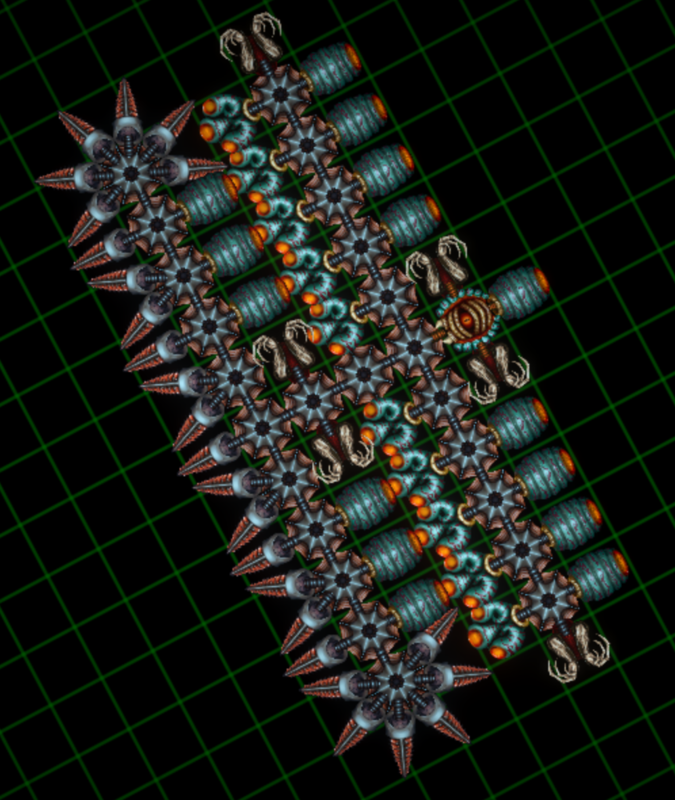 I personally use the "Wall of Death" configuration, but as long as you have a siphonophore design that works for you, it'll do. 2. Swim to the extreme left/right side of the arena, then swim upwards. Make sure your siphonophore is in a position where the boss' zooids won't spawn on top of you. 3. After the boss spawn is triggered, try to squeeze your way to the boss' core, and eat away! Be sure to do this as fast as possible, so as to minimize the number of minion spawns. If your siphonophore is unable to squeeze your way to the core area, you can eat some of the boss' "wall" to make your way there. 4. Celebrate victory, and prep for whatever's ahead. 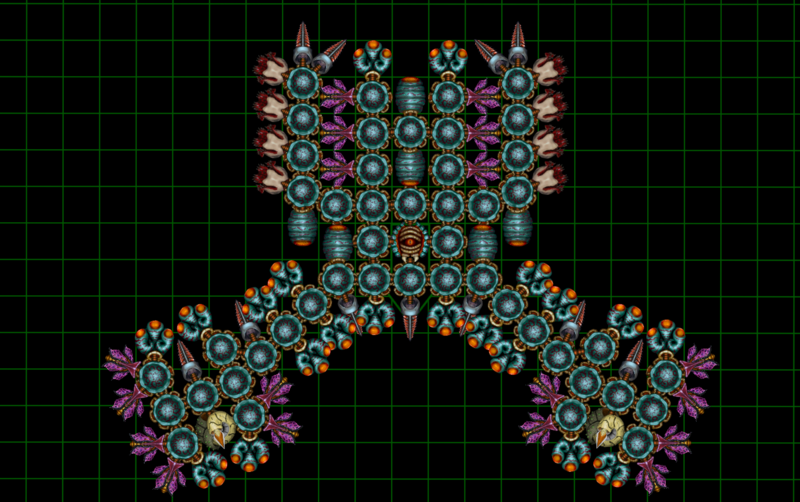 And now, for the true final boss of this build of the game. 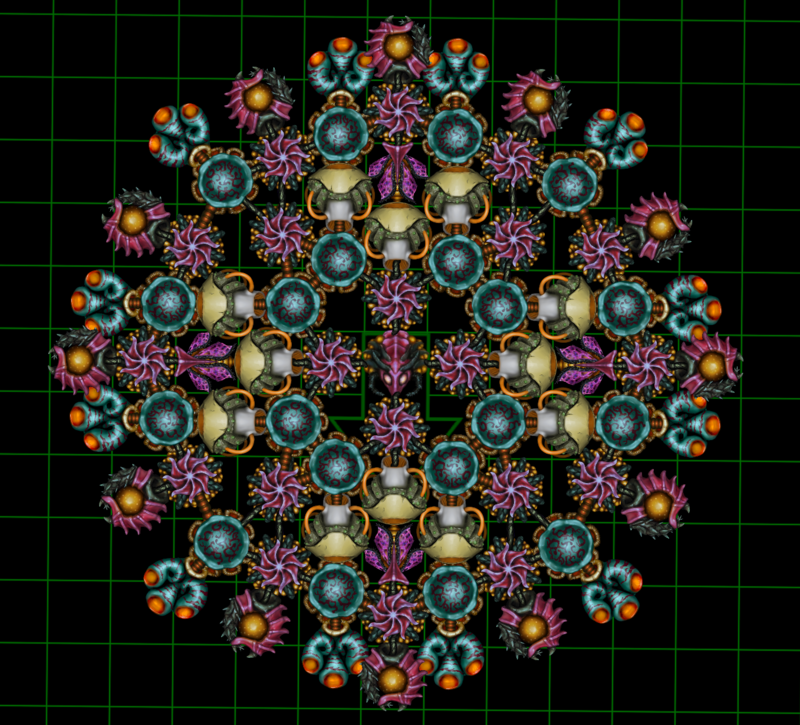 Seen here is an approximate recreation of the boss done by yours truly, approximate, due to the impossible placement of some of the movement zooids on the actual thing (they face diagonally, despite there being two cardinally-placed zooids in the way, which would prevent diagonal placement). What makes this particular boss dangerous is the arena that it is fought in. Every single wall of the arena is made up of stationary balls of spikes, essentially being the first boss' arena on steroids. It does not help that the Advena species' Spike zooid is able to instakill zooids given enough force, and the boss' few-but-still-present poison-spewing eater zooids only serve to make the spikesmhave an easier time chewing up your siphonphore. There are 2 ways to beat this boss. 1. The direct way: A risky-sounding tactic that works most of the time. Make your siphonophore small and maneuverable, and dart around the boss until you end up on one of its rear "pylons", then eat away. Just beware of the single spikes; a small siphonophore can easily get its core instakilled, even by a lone spike. 2. The cheesy way: A tactic that always works, which makes use of the boss' AI, as well as some creativity. You must at least have one eater zooid that produces poison (i.e. Advena or Buginis eater zooids). The boss will always try to get at you near the entrance of the arena, sometimes turning to use the spikes on its "pylons" to reach you. Whenever it does the turn, simply move forward slightly from within the safe player spawn area, spray poison, then retreat. Over time, the boss will die. There are multiple ways to make this easier, however. 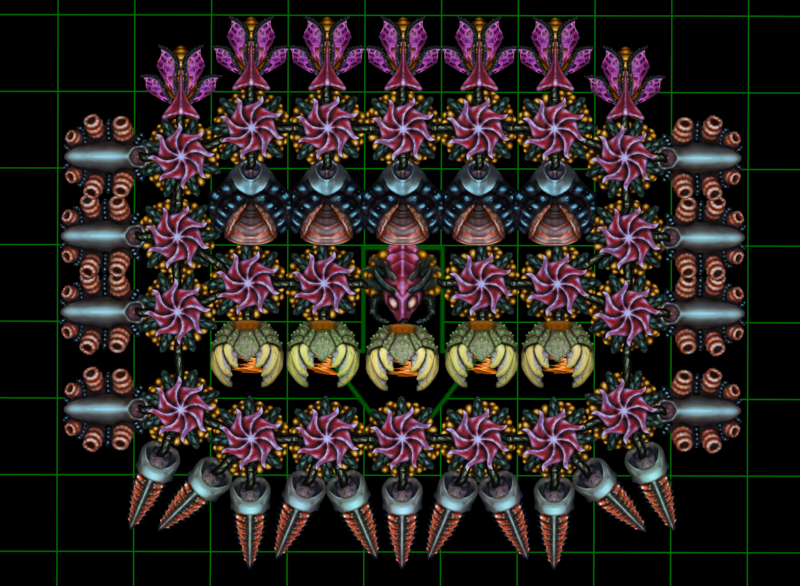 For one, pairing the Saenus Beeforus' Eater Zooid (the one that can push) with either Advena or Buginis eater zooid will extend your range if you know how to use them together, allowing you to essentially camp from within the safe zone. Furthermore, the boss' AI actively tries to dodge poison mines, which means that creating a mass of poison mines and advancing forward will lead to the boss' AI seizing up, leaving it terribly vulnerable. Once defeated, you will gain access to the area where all my gigantic creations are birthed: Free Roam mode. 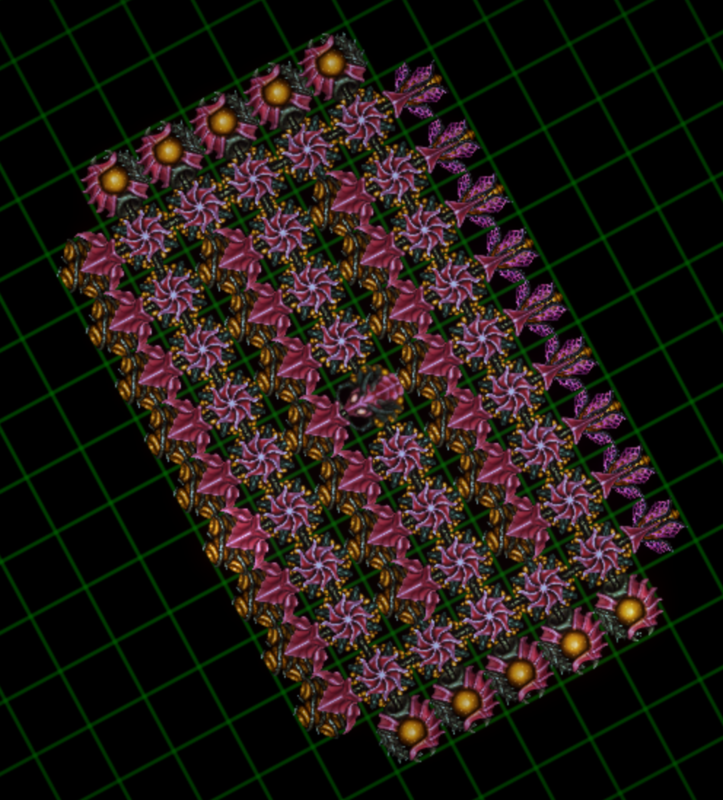 Sipho community · Replied to Trogsothoth in These are pretty cool things. Fourth* Boss (Advena Boss, because the ??? Boss, as hard as it is, isn't the final one), you will enter Free Roam mode. 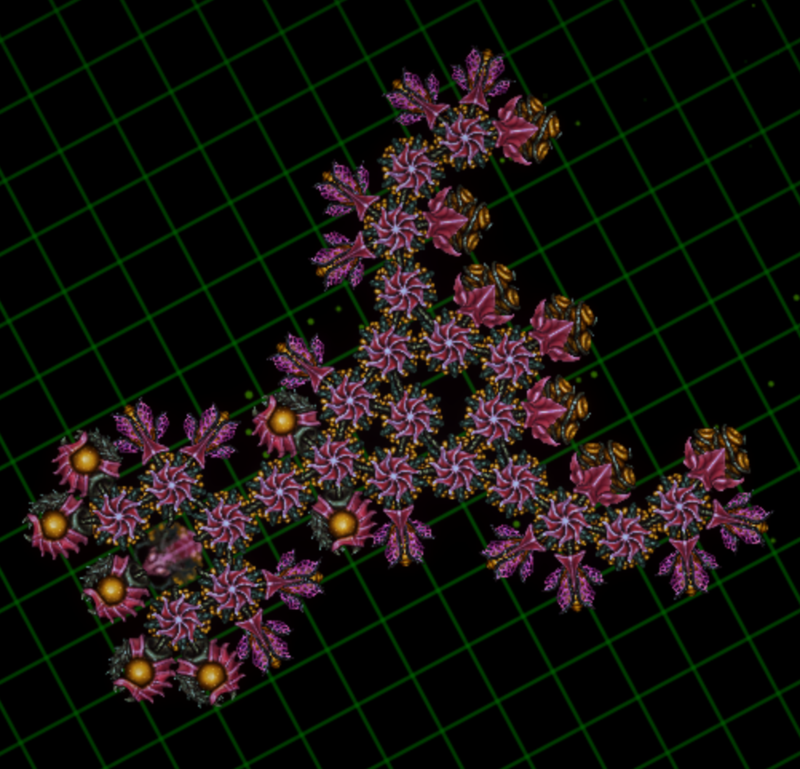 My creations basically hinge on a lot of Free Roam farming (enemies spawn infinitely there, along with natural-spawning nutrient pieces), so they can take quite some time to make. Sipho community · Replied to TH3_3RR0R in These are pretty cool things. Also, aforementioned "tan-blue" species is actually different from the image you found. That's the slightly older version. To celebrate the naming of the Queen of Poison, I've decided to give it a makeover, like the Advena Boss. 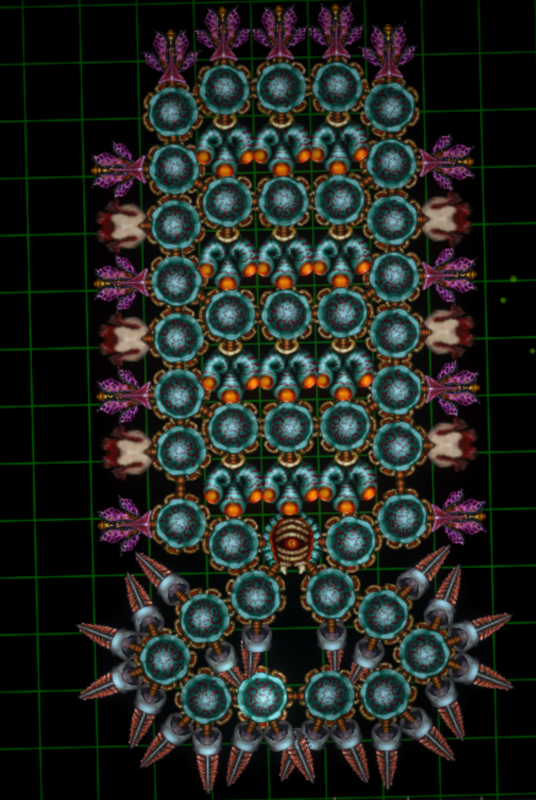 And, after much farming in free-roam, I present to you: The Emperor of Corrosion. ...and thus, the long-ranged Wall of Flak was born(with long-ranged poison on the sides for good measure)! Now that is a killing machine! Oops, did I say "just one more"? ...that's right. It's back from the old days. 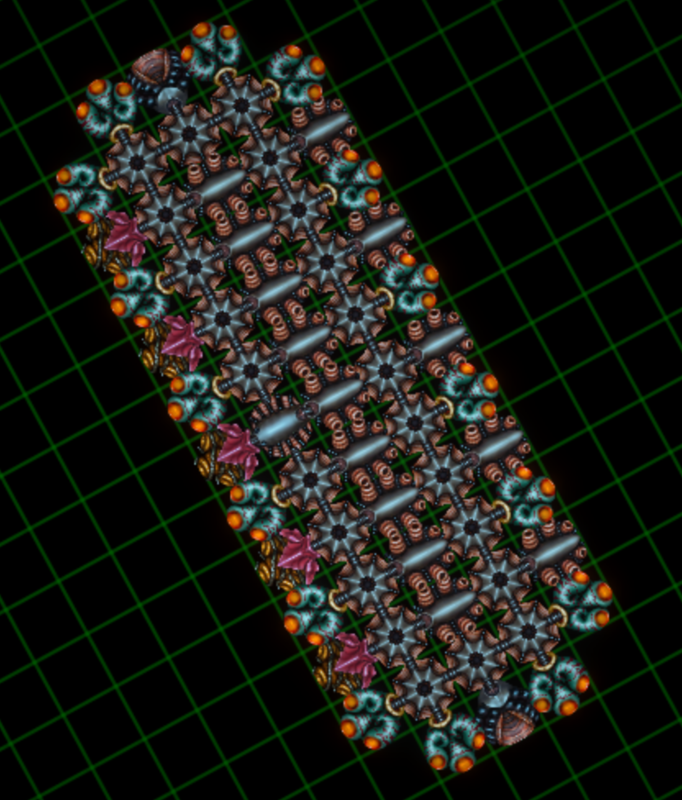 3 layers of Flak still does wonders, even if the range is not what it used to be. Sipho community · Posted in New to the game. No cheats, just farming at the Free Roam stage. Use the species that starts with the "Claw" zooid, and make a wall of claws. Charge at your enemies, attack with the Claws and watch as everything just dies. The "Jet" movement zooid of that species really helps with maneuverability as well. 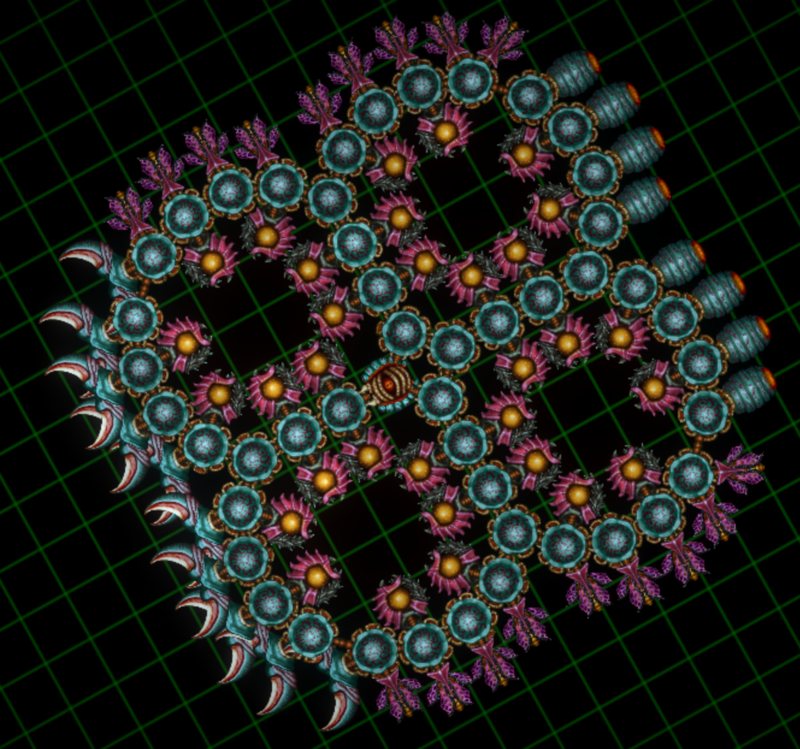 I call this build: The Wall of Death. Here's an example of what you should aim for. 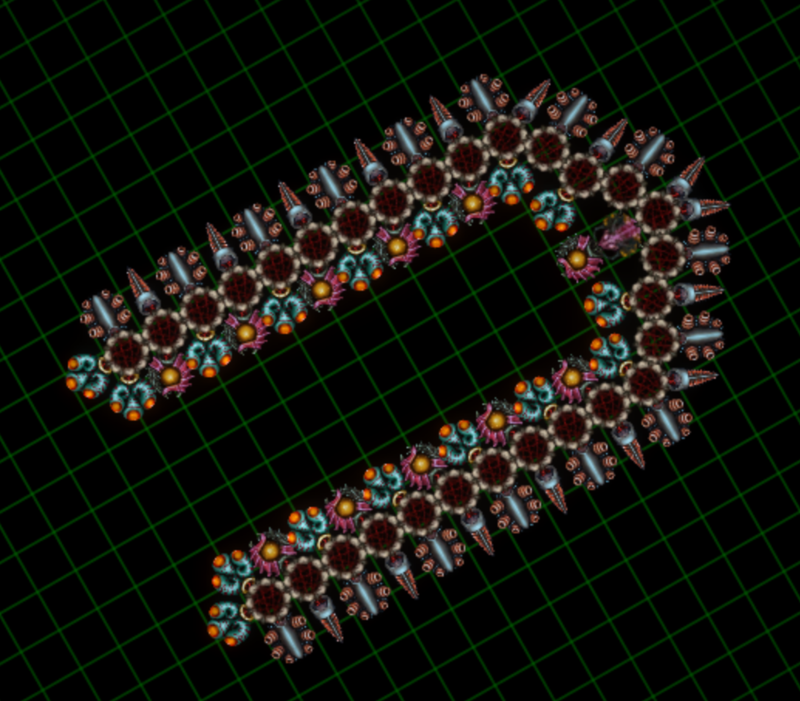 Just a generic killing machine. Sipho community · Replied to Dominas in These are pretty cool things. 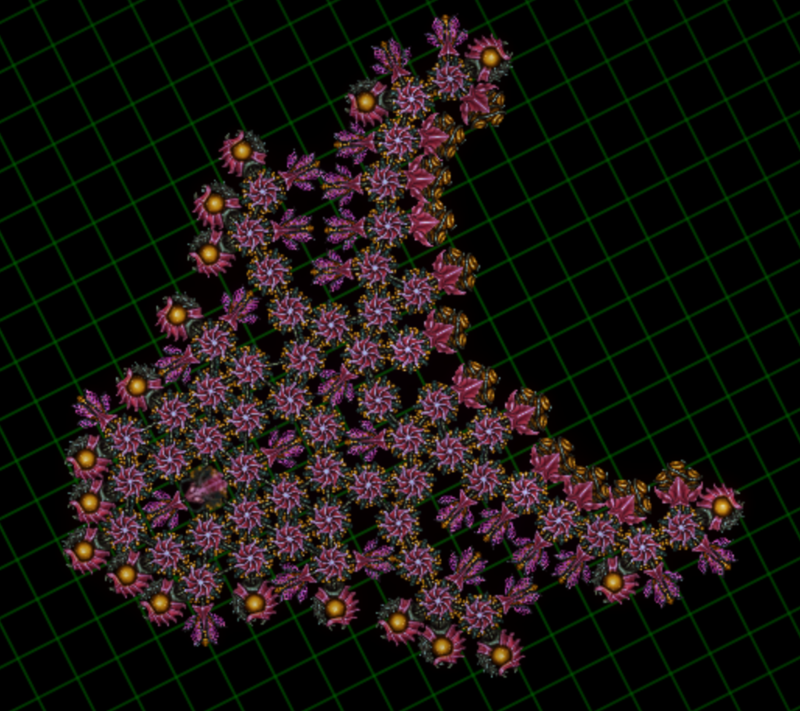 This one is based on the "long range spike" idea you posted, utilizing the "pushing" feature of a certain Eater zooid to make this entire creature charge forward and extend its spikes to impale its foes. Scarily effective. Sipho community · Posted in These are pretty cool things. Those creatures of yours are indeed pretty cool.